JACKSON, Miss. (AP) — Two of the Mississippi teenagers who helped rescue a toddler as her mother’s sport utility vehicle was sinking in a creek say they are glad a judge has dropped charges against the woman, whose other two children drowned as the unattended vehicle slipped underwater. Bobby Johnson, who is fire chief in the small town of Leland where the children died March 9, also says he agrees with Washington County Justice Court Judge Laverne Simpson’s decision to drop charges against Jenea Monique Payne, 25. She was initially charged with negligent homicide and child neglect after investigators said she left her three children alone in her sport utility vehicle while she went into a grocery store. A candlelight memorial service is set for Friday evening in Leland, and funerals are Saturday for Payne’s sons, 1-year-old Rasheed Johnson and 4-year-old Steve Smith. “I think they should have showed some mercy from the beginning because that woman lost two of her kids. She has to live with that for the rest of her life, so she needs some mercy,” 17-year-old Jacob Humphrey, who worked with three other teenagers to rescue 2-year-old Raelynn Johnson. The four young men — 18-year-old C.J. Holland, Jacob Humphrey and his twin brother Seth Humphrey, and 15-year-old Austin McNemar — spoke to The Associated Press on Thursday at the Mississippi Capitol. The four are students at Riverside High School in the small community of Avon. March 9 was the final Saturday of spring break in the rural Mississippi Delta, and heavy rains had been pounding the flatlands. The four were hanging out in Leland, where the fire chief is the twins’ stepfather. McNemar said he and his friends had just finished eating when they saw the vehicle roll into swollen Deer Creek. Seth Humphrey ran for help and Holland jumped from a small bridge onto the SUV and started kicking the windows to try to break them. A law enforcement officer threw a glass-breaking tool toward Holland, but the tool fell short, and McNemar said he and Jacob Humphrey jumped into the cold water to retrieve it. McNemar said Jacob Humphrey used the tool to break a window, and Holland reached in and pulled out the little girl. Holland said he’s not a strong swimmer and was tired. “He had to hold me up,” Holland said, pointing toward Jacob Humphrey. The teens got Raelynn safely out of the creek. “That’s when we found out there was more in the car but we couldn’t see them,” McNemar said. Mississippi lawmakers honored the teens Thursday, giving them standing ovations in the House and Senate. Republican Lt. Gov. 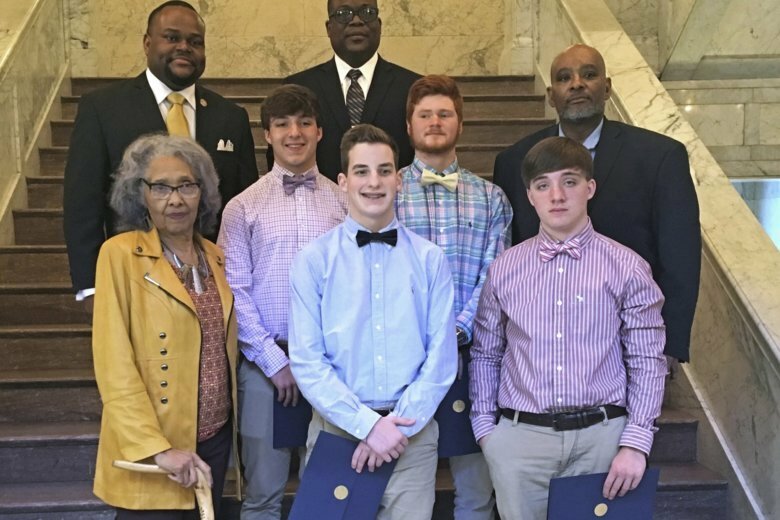 Tate Reeves called them “true Mississippi heroes.” Democratic Rep. John Hines of Greenville presented them with certificates of appreciation, and several lawmakers posed for pictures with them. “Gentlemen, if there’s anything I can ever do for any of you, please do not hesitate to call me,” Hines told the teenagers. Simpson dismissed the charges against Payne after a hearing Tuesday. Holland, Jacob Humphrey, and Johnson said they agree with Simpson’s decision. Prosecutors could still seek to indict Payne. Washington County District Attorney Dewayne Richardson previously said he was waiting for a report from Leland police before deciding what to do. Donald Coleman, the principal of Riverside High School, accompanied the four teens and other students to the Capitol. Coleman said he’s watching the four young men, in case they need counseling.